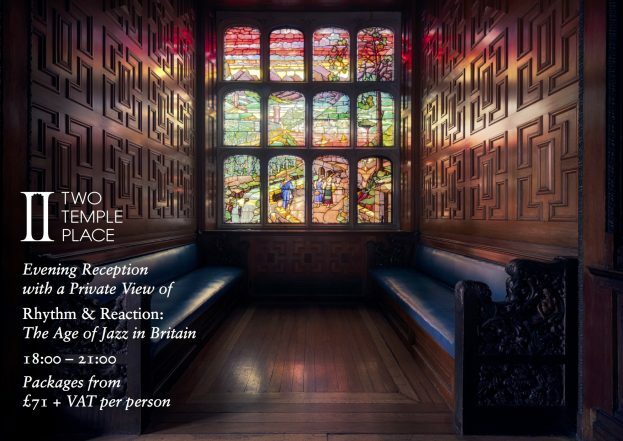 Make Two Temple Place your home for the evening, and wow your guests as this hidden gem of late Victorian architecture comes to life providing the stunning backdrop to our Winter Exhibition; Rhythm and Reaction: The Age of Jazz in Britain. Available for drinks receptions for up to 150 guests, take advantage of our exclusive hire packages which perfectly combine delicious drinks and canapés with an exclusive Private View and guided tour delving into the fascinating history of William Waldorf Astor’s opulent estate office at Two Temple Place. Marking 100 years since Jazz reached Britain, Two Temple Place will reopen to the public on 27th January 2018, with its seventh annual Winter Exhibition, Rhythm & Reaction: The Age of Jazz in Britain. Produced in partnership with The Arts Society, on the occasion of its 50th anniversary, this major exhibition will bring together paintings, prints, cartoons, textiles and ceramics, moving film, instruments and the all-important jazz sound to explicitly examine the influence of jazz on British art, design and wider society. Two Temple Place, a magnificent neo-Gothic mansion on London’s Victoria Embankment, is owned and run by the charity The Bulldog Trust.